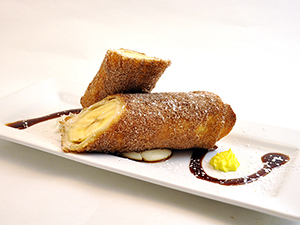 Purdue University created this more upscale take on fried bananas to serve at catered events. Although it looks fancy, it’s simple to make—the crispy shell is formed with a flour tortilla and rolled in cinnamon sugar while still warm. 1. Preheat deep fryer to 350 F. and fill with soybean oil. Heat for 30 minutes. 2. Meanwhile, in mixer bowl, combine mousse mix and heavy cream. With electric mixer, whip at low speed for 1 minute. Scrape down sides of bowl and continue to whip at high speed until peaks form. 3. Spread 6 tablespoons mousse evenly on flat tortilla, making sure not to go all the way to edges. Slice banana lengthwise into two pieces. Place banana pieces in center of tortilla. Starting at bottom of bananas, fold short end of tortilla over bananas. Fold in sides of tortilla and continue to roll tightly until bananas are wrapped and roll is compact. 5. To serve, place 2 tablespoons mousse in middle of rectangular serving plate. Cut roll diagonally in half. Place roll on plate on top of mousse, stacking one piece on top of the other. Drizzle with 2 tablespoons caramel sauce and dust with confectioners’ sugar.